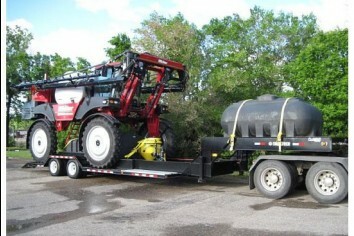 In stock are combine trailers, sprayer trailers, and header transports. Something to tow a couple of headers around the back country, or perhaps a 5th wheel semi trailer for the combine or sprayer, we carry it all and would happy to help you out. We have the widest selection of Ag Transport Trailers available with service and support. Heavy duty, innovative, and top of the line are just some of the words used to describe agricultural trailers manufactured at Behnke Enterprises, Inc. Whether a sprayer trailer, tender trailer, anhydrous wagon, nurse tank trailer, or cone trailer, you will find the best product for your needs. B-B trailers are built to withstand whatever you throw at them. Zinc primer and powder coat finish add to the durability. Quality components ensure that you will feel confident when pulling your load. If you are a custom harvester or an implement dealer delivering to customers, you want mobility, durability and serviceability from your combine trailer. Trailtech combine trailers offer this and so much more. The Harvester series combine trailers have been built to handle today's combine. 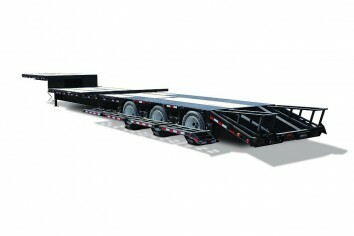 The increased weight and overall size of these units demand that the trailers are tailored to fit. Each model offers a heavy-duty mainframe and crossmembers for proper strength. The carrying bed area is designed to extend out to 13 ft. to accommodate any size combine. 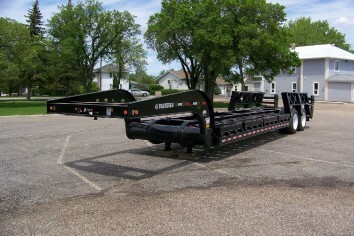 The unique flip over design of the carrying bed allows these trailers to go from 8 ft. overall width up to 13 ft. easily and safely in just minutes. D-rings are located along the mainframe of the combine trailer for proper load securement, and pintle or fifth-wheel hitches are available on these combine trailers. The Model CT220TT combine trailer features our patented Torque Tube fifth-wheel hitch. This wide neck hitch allows the combine to be positioned forward when loaded thus transferring adequate weight to the tow vehicle and trailer, making for a properly balanced load. The torque tube design provides the strength required to handle these big machines. When moving or delivering your combines this extra attention to detail ensures that you and your load arrive on time. The Trailtech Sprayer series is built to the needs of the applicator. Sprayer trailers are manufactured to offer the applicator versatility and convenience of operation in order to maximize operator efforts. While some models feature a level load carrying bed, others are equipped with a drive over carrying bed, each designed to handle sprayers of all sizes. The running boards with dovetails let you drive on and off the trailer with ease. The model HC220 has plenty of room for water tanks and sprayer support equipment. The large area between the main frame can handle large water tanks easily. Pintle or fifth-wheel hitches allow the trailer to match your towing needs. Loading and transporting your straight cut headers and swathers is now easy and simple. Whether traveling long distances or simply moving your equipment around the farm, these transports are built to last. The Model SR6000HT is designed for a single rigid header, the SR18000T has been designed to transport draper, flex, corn or pick up headers while the DR21000 is a hydraulic fold-up transport that can carry two headers. The Model ST2000 is a full carry swather transport.